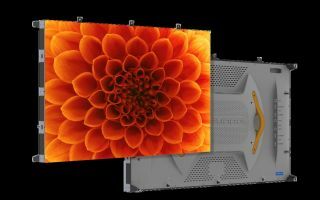 Leyard announced the finest pitch LED display in the industry with its launch of the 0.9mm Leyard TWA Series LED video wall display—delivering a pixel pitch of just 0.9 millimeters (mm). The Leyard TWA Series 0.9mm joins the existing Leyard TWA Series line of fine pitch LED video walls available in 1.2, 1.4, 1.8 and 2.5 millimeter pitches. Leyard TWA Series LED displays offer a crisp, high-contrast image and are built to maximize energy efficiency, utilizing 35 percent less power than conventional LED displays. When the display is in standby mode with a black screen, it consumes up to 60 percent less power than the LED video wall displays on the market today. The Leyard TWA Series is the first LED video wall solution to feature an “flat panel” design that includes a 16:9 form factor optimized for the most popular high resolution standards. Leyard TWA Series displays are self-contained units with standard HDMI inputs and looping, along with optional redundant configurations. The larger 54-inch cabinet means more of the video wall is factory-aligned, easing the time and cost of installation with fewer displays to align and seams to perfect. The larger units also mean that fewer displays are needed to create a video wall, reducing the potential points-of-service.